The Second World War was a period of remarkable advances in technology and many new weapons were invented during this period, some of which entered production and actually saw service in the war, while others never left the drawing board. Most of us are familiar with the secret weapons the Nazis had at their disposal in the last months of the war that were expected to turn the tide against the Allies. 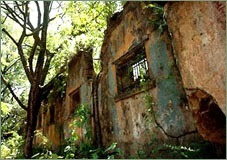 However, Germany had a reputation as a scientifically advanced nation well before the outbreak of hostilities in 1939. 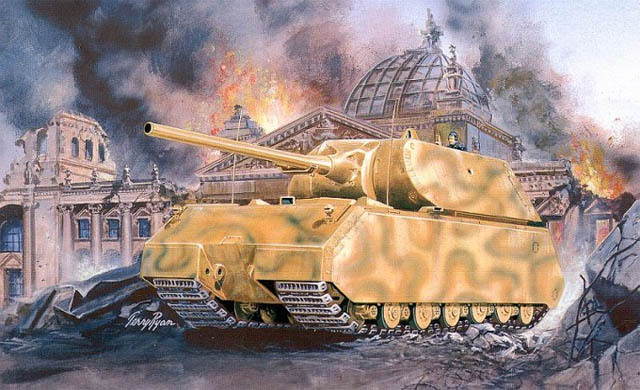 At the beginning of the war, the Germans had a significant advantage in many areas of military technology, although it lost the lead, for a variety of reasons, as the war progressed. - some even had stealth coating, rendering them invisible, when surfaced, to Allied planes using infra-red searchlights. 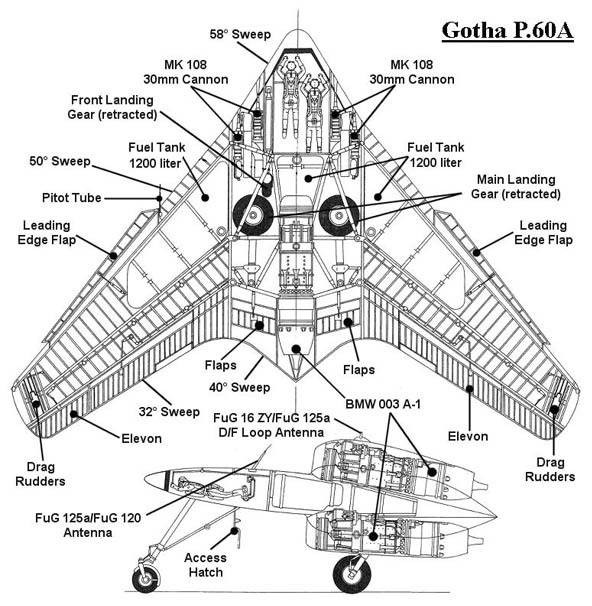 This was years ahead of its time, similar to the radar absorbing coating of modern stealth aircraft. Germany also developed synthetic fuel from coal, in order to lessen its dependence on imported oil for its petroleum needs. And very early in the war, German bombers operating at night used fixed radio transmitters, with receivers installed in the bombers, to very effectively navigate to their target areas. This system was the forerunner of GPS that we are familiar with today and for the first couple of years of the conflict at least, Allied air forces had no comparable system. Thinking the war was already won, Hitler placed less emphasis on weapons development. Later, when the war turned against them, Germany turned to new, highly sophisticated weaponry in a desperate bid to turn the tide. These wonder weapons, or wunderwaffe, mostly reached the field of combat too late to make a difference, although some, like the V2 rockets, were deployed and were superior to anything possessed by the Allies at the time. 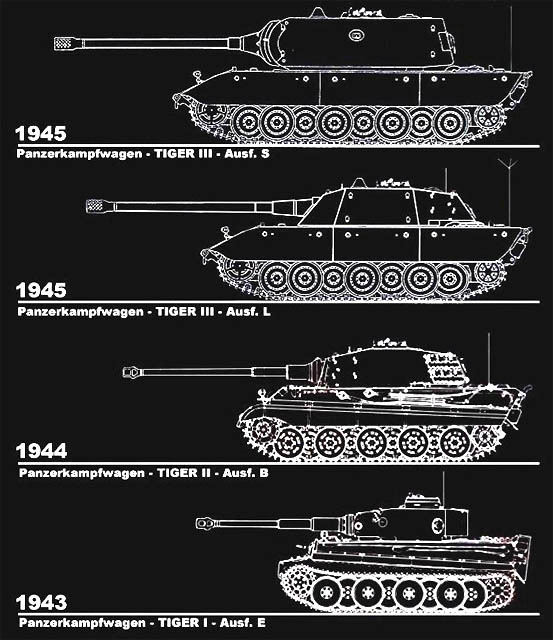 Most of these weapons were very advanced for their era and with the exception of the gigantic tanks, were all developed by other counties in the subsequent decades. There are too many to cover in detail in this article, but here are some of the most fascinating ones. 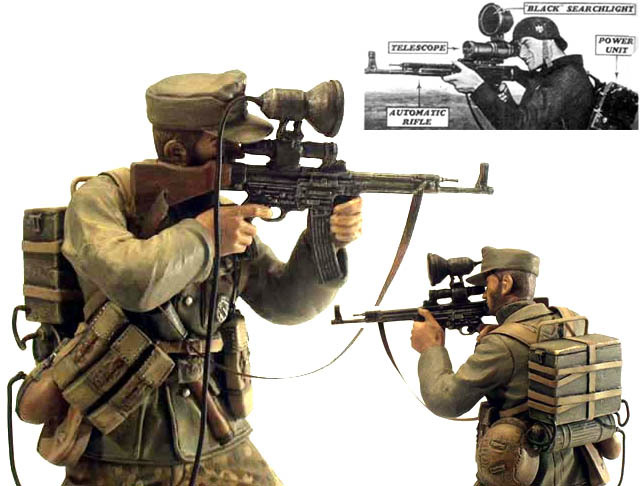 The Sturmgewehr 44 was the first ever assault rifle, similar to the modern M-16 and AK-47. The ZG 1229, also known by the code name Vampir, was an infra-red sight designed so that this rifle could be used by snipers at night. 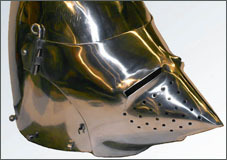 It was first used in combat in the last months of the war and weighed about five pounds, but was also connected to a thirty pound battery support pack, strapped to the soldier’s back. 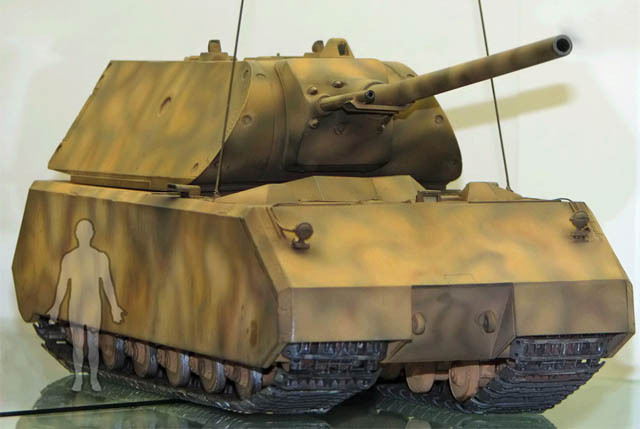 German engineers worked on a number of designs for super-heavy tanks and the Panzerkampfwagen VIII Maus was the heaviest model of which a working prototype was made during the war. 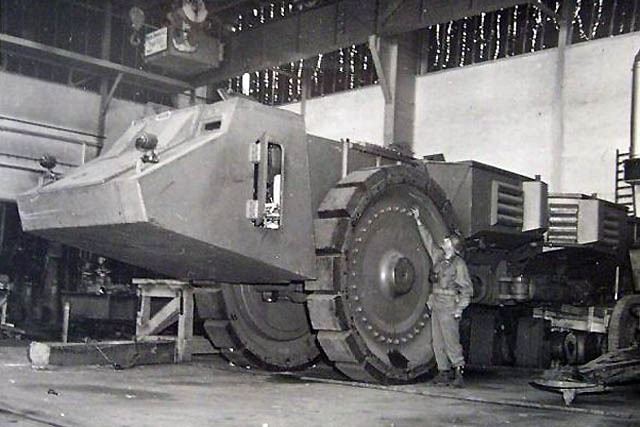 This tank weighed in at around 180 tonnes and this ended up being its principal problem. 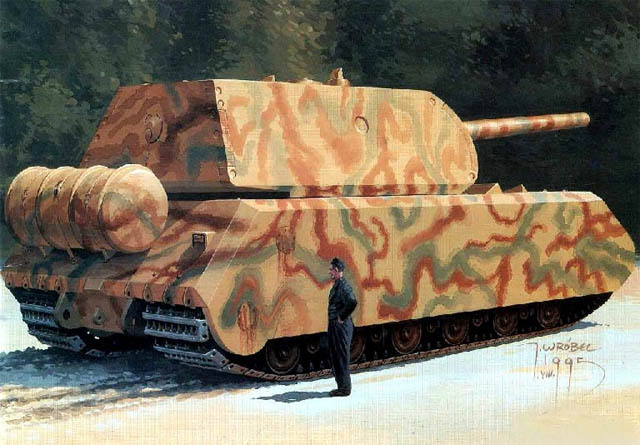 No engine was powerful enough to allow the tank to achieve the desired speed of 20 km/h, with only 13km/h being reached and that under ideal conditions. It was also too heavy to cross bridges. However, because the tank stood relatively high off the ground, it could actually ford deep streams and for deeper rivers was able to go underwater and drive along the bottom. However, to do this it had to be partnered with another tank, which supplied the electrical power through a cable. Amazingly, a long snorkel, allowing the crossing tank to submerge to a depth of 45 feet, fed air to the submerged tank’s crew. 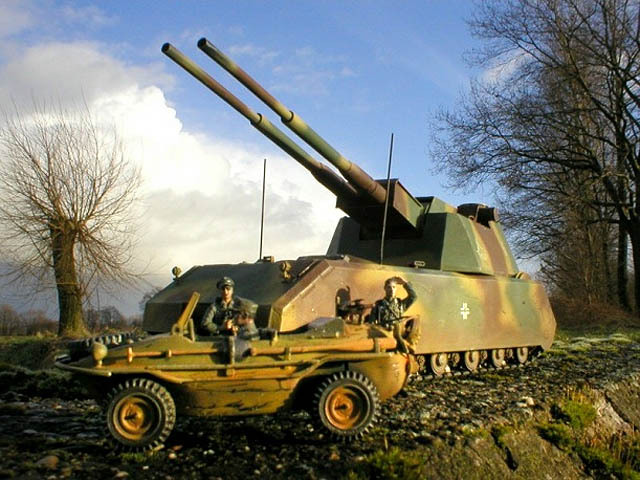 The Landkreuzer P-1000 Ratte, from "My Tank Is Fight"
The Fieseler Fi 103, more familiar as the V-1, from the German vergeltungswaffe or vengeance weapon, was the world’s first cruise missile. 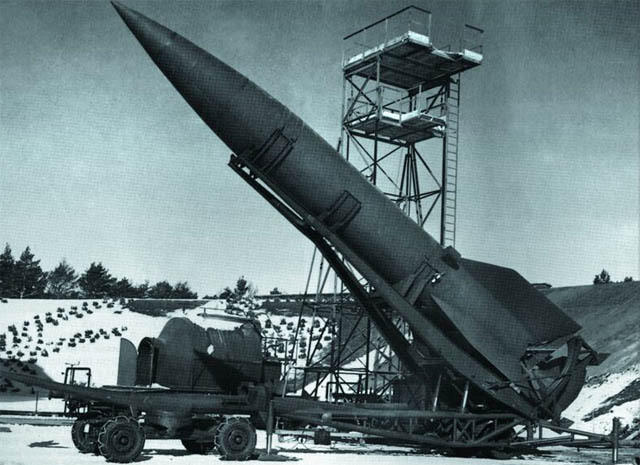 The V-1 was powered by jets and carried an 1875 lb warhead with a range of 125 miles, the first ones being launched at England on June 13, 1944, just after D Day. The missile was sometimes delivered in the air from bombers, but was mostly ground launched, with long ramps hidden in wooded terrain. However, these were clearly visible from the air, so were usually bombed very quickly, forcing the German army to use mobile ramps instead, which they moved around the Pas-de-Calais region of the French channel coast. Despite its fearsome reputation, although nearly 9,250 V1’s were fired against London and other English towns and cities, fewer than 2,500 reached their target, the others being destroyed by anti-aircraft fire, fighters, and even barrage balloons. However, V1 firing continued, at Antwerp and other cities on the European mainland as well as against England, until Allied forces finally captured the launch areas in late March 1945. 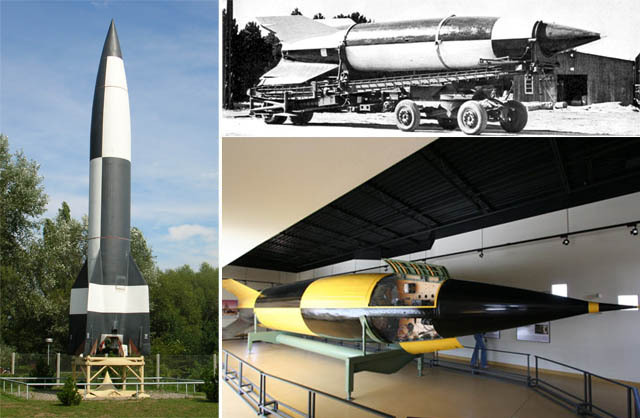 The V1’s successor, perhaps a little predictably known as the V-2, was the original long-range ballistic missile and the first man-made object to achieve sub-orbital spaceflight. 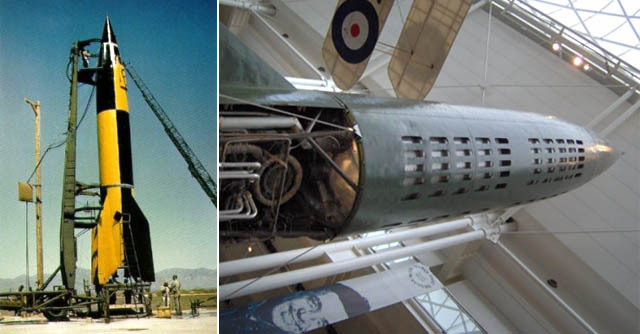 With a range of 200 miles and a 2150lb warhead, the V2 also traveled at 2500 mph, so it was impossible to intercept and hit its target from above faster than the speed of sound. There was no advance warning and although the V2 was far from accurate, it caused mass terror and panic when used against civilians. The rockets were also fired from mobile launchers, which were difficult to locate either before or after they were fired. 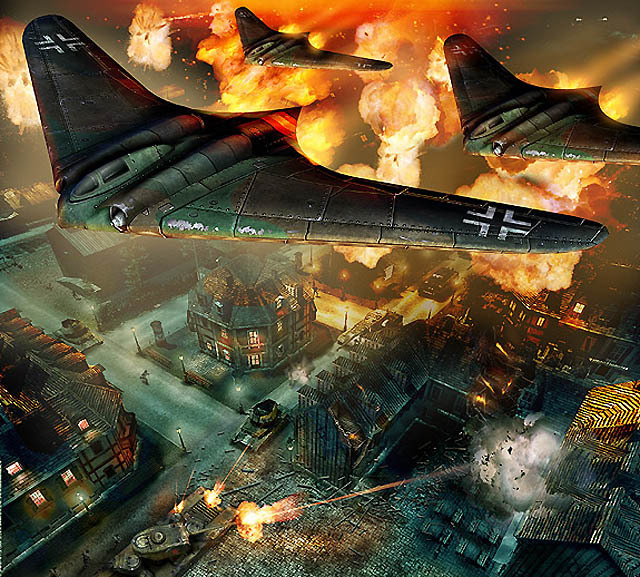 Over 3000 V2’s were fired against the Allies, killing over 7000 people, both military and civilian, and the rocket threat was only finally ended when the German army was forced to retreat beyond the launch range. 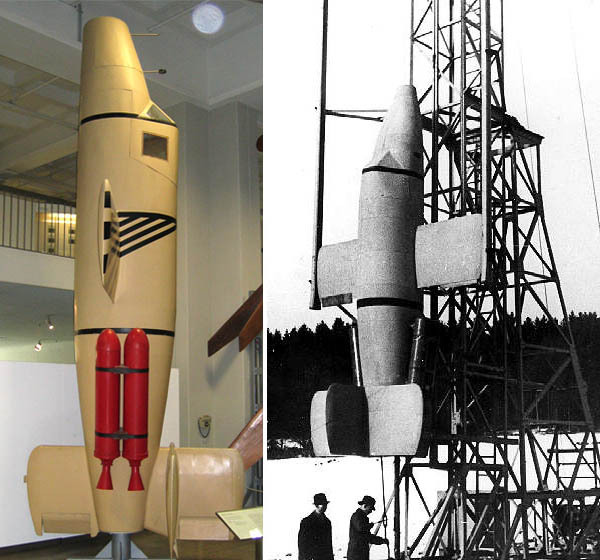 The V2 was very expensive to produce, inaccurate and only carried a small warhead, but had the Germans had more time to develop it, the war might have taken a very different course. They may have been able to attach a nuclear warhead, and were working on using biological and chemical weapons in the rocket program. By the last days of the war, Germany had supplies of the nerve agents sarin, tabun and soman, but had never used them. A rocket launching platform towed behind a submarine, intended for use against the North American continent, was successfully tested and scientists were also supposedly at work on the V9 rocket. This version would actually have a pilot, who was to bail out at the last minute with a parachute and be rescued at sea by a submarine. 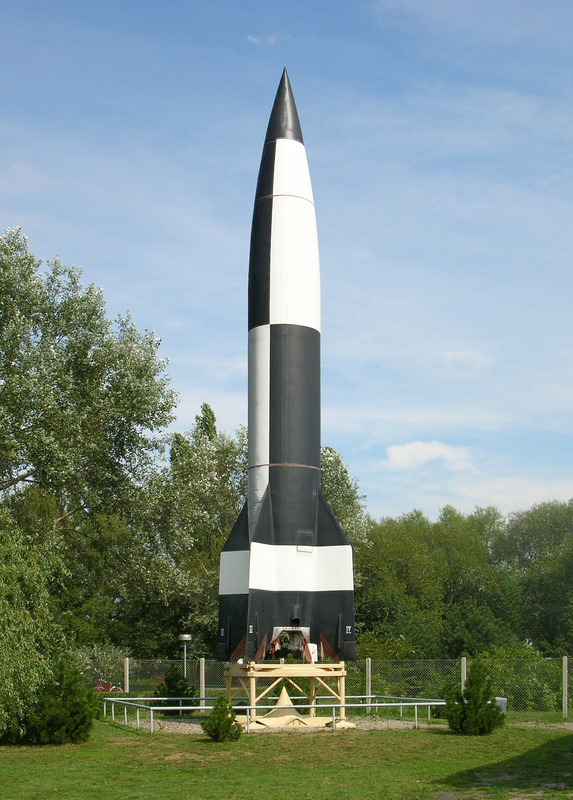 The V9 was to be armed with a one ton warhead, and be able to reach the US from Europe in just thirty five minutes. At the end of the war, American, British or Soviet forces captured many German weapons, undeveloped projects and blueprints, plus the scientists who worked on them. Rocket scientists in particular played a large role in the space race and were instrumental helping the United States achieve the moon landing in 1969. With aircraft, some of the German designs not only made it off the drawing board, but also flew in combat, although often not in sufficient numbers to alter the course of the war in Germany’s favour. 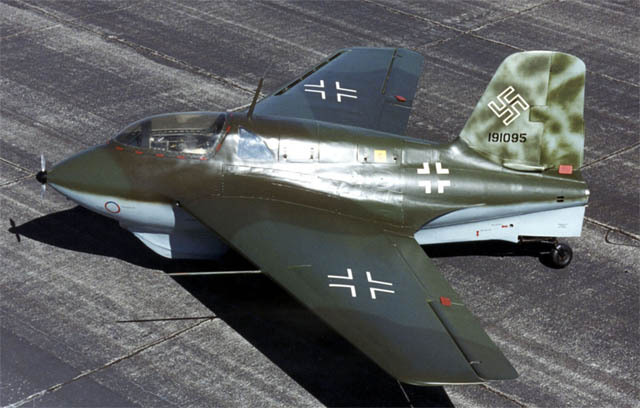 The Messerschmitt Me 163 was the only operational rocket-powered fighter plane of the war, but although it was very advanced it performed poorly in combat and downed limited numbers of Allied aircraft. 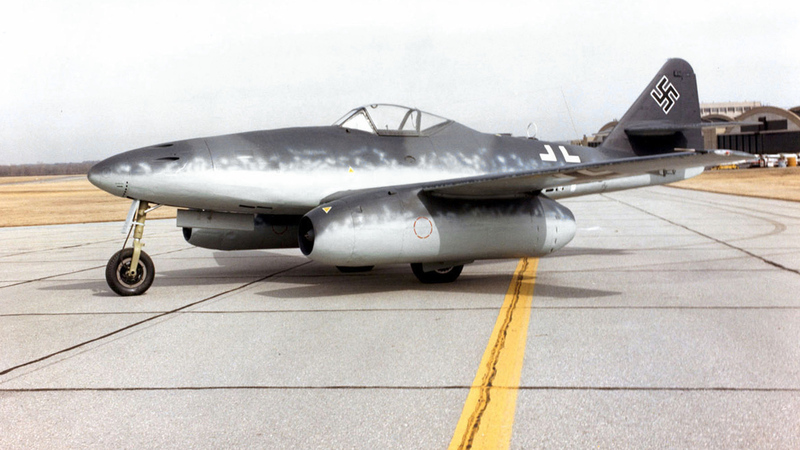 The first turbojet fighter aircraft, the Messerschmitt Me 262, first appeared in the skies over Europe in 1944. Although arriving too late to seriously impact the course of the conflict, the Me 262 still claimed over 500 Allied aircraft, losing around 100 Me 262s in the process. Intended to be the successor of the Me 262, the Focke-Wulf Ta-183 fighter jet had only been tested in wind tunnels by the end of the war, although the plane’s basic design was developed in Argentina after 1945. 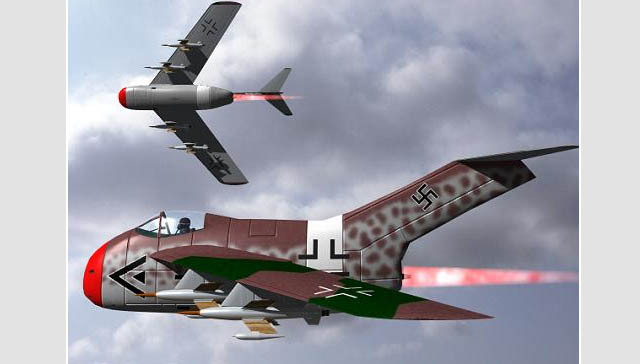 Is thought that the Soviet MiG-15 was based on captured German plans, and the two planes do bear some resemblance, although Russian historians reject these theories. 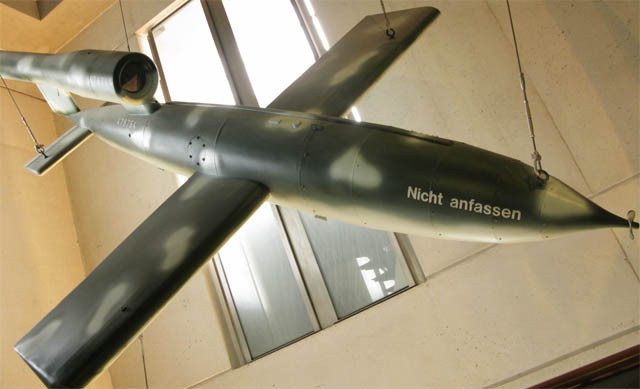 The Bachem Ba 349 was an experimental rocket-powered interceptor. 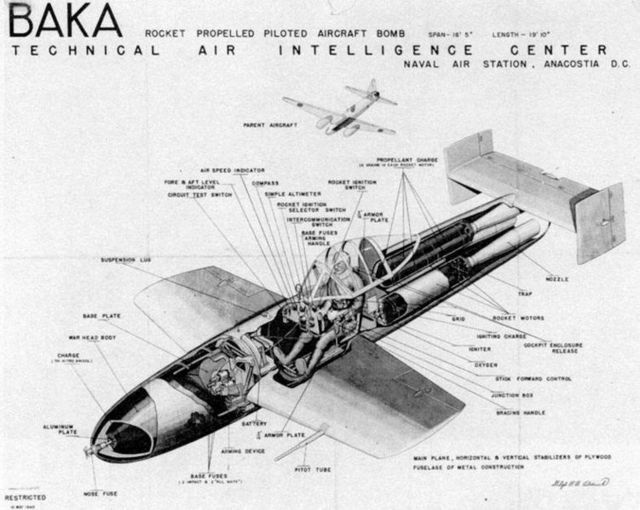 With a vertical take off rather than using vulnerable airfields, it was intended to operate like an unmanned missile. Most of its journey to reach enemy bombers was radio controlled by ground personnel, although it did have a pilot, who would aim at the target and fire its rockets when close enough. However, the test pilot was killed in the plane’s first and last test flight in March 1945 - more info. 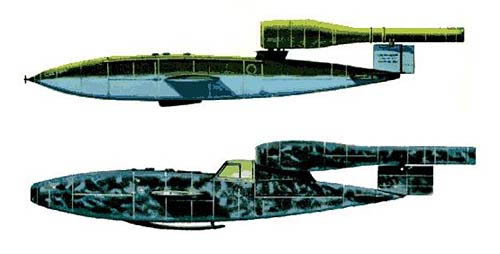 The Arado 234, the world’s original jet bomber, was very advanced for its time. It was equipped with automatic pilot, an ejector seat, pilot-aimed rear guns, and powered by twin jet engines, it proved far too fast for Allied planes to intercept. 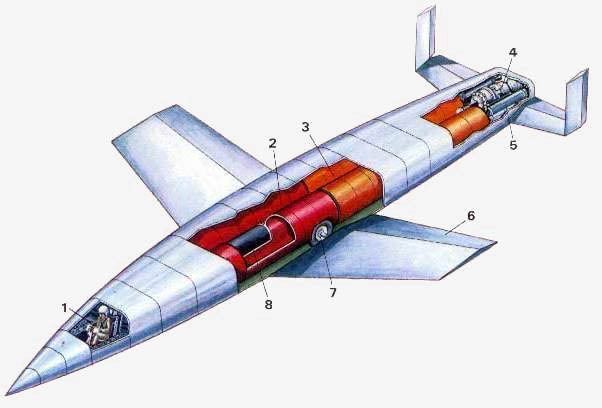 Silbervogel, which translates as Silverbird, was a rocket powered sub-orbital bomber, which was tested in wind tunnels, but never actually produced. 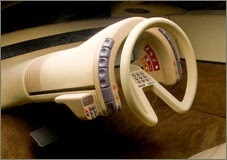 However, it was a forerunner of future winged space vehicles such as the Space Shuttle. 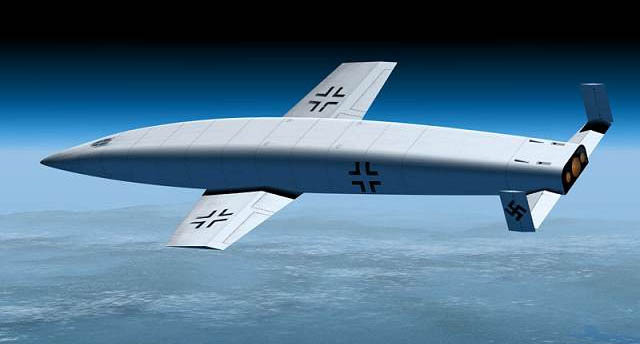 Scientists believed that the Silbervogel would be able to cross the Atlantic carrying an 8,800 lb bomb to the continental USA, and then land in territory held by Japan in the Pacific. It would cover such a vast distance in a series of hops. 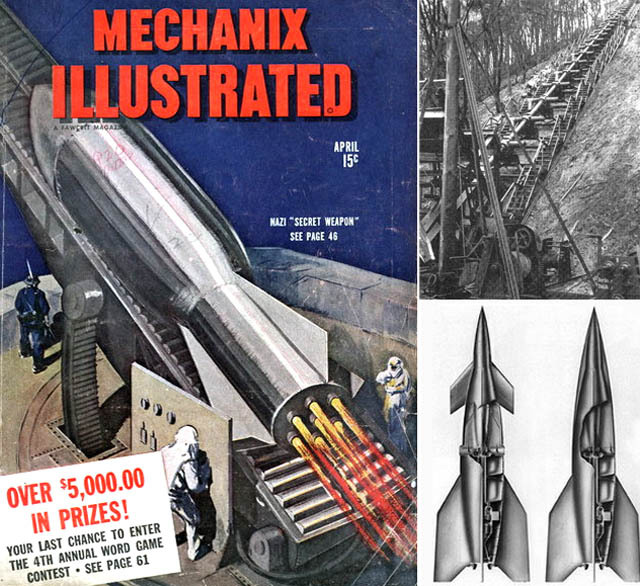 After reaching 1200 mph with the help of a rocket-powered sled on a two mile rail track, the Silverbird’s rocket engines kicked in once it was airborne. 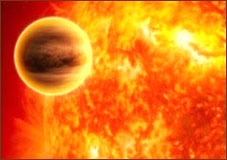 Eventually flying at ninety miles and at a speed of almost 14,000 mph, it would slowly fall into the stratosphere and greater air density would give it a bounce to regain altitude. The size of the bounce would decrease each time, but German technicians still figured the Silverbird was very capable of making a mind-boggling trip of between 12000 and15000 miles. The earliest military helicopters were built by Germany and mainly saw service in the Mediterranean, but a few were also used in the Aegean and Baltic theatres. Both the Flettner 282 and the Focke Achgelis 223 (shown here) were never built in large numbers as a result of the production facilities being destroyed by Allied bombers. - and the wind cannon. The vortex gun was designed to try and take advantage of the known fact that air turbulence could bring down large aircraft and break them into pieces. 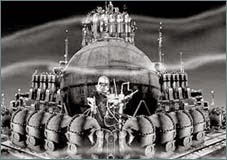 The vortex gun’s shells, containing coal-dust and a slow-burning explosive in the center, were supposed to create an artificial whirlwind or tornado, which would make enemy airplanes lose control and thus fall from the sky. During testing and under near perfect conditions this odd device seemed to work quite well. It wasn’t known if the air pressure would actually cause structural failure in a plane, but the pressure it put on the wings would probably be very high and that might be enough to down the aircraft. Fortunately for the Allies, the vortex gun was never put into practice. The wind cannon was designed to shoot a powerful jet of compressed air, as effective as a small shell, against enemy aircraft. 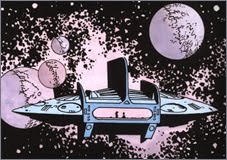 As you can see from this picture it was an odd looking device. In tests, such a blast could break a 25mm wooden board from over 600 feet away. However, the potential effect on a fast moving aircraft would obviously be very different than against a fixed target, so as intriguing as the wind cannon was, it was unlikely to have produced the desired results. Even so, a cannon was set up on at one on the Elbe bridges in the closing stages of the war, but didn’t succeed in bringing down any hostile planes. 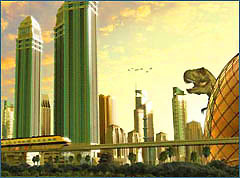 The sound cannon was supposed to turn explosions of oxygen and methane into noise that could kill. A very high amplitude sound beam would be emitted at pressures exceeding 1000 milibars from a distance of around 150 feet, which would be fatal to a human exposed to it for thirty seconds. At a greater distance, a soldier would still suffer great pain and be seriously incapacitated for a considerable time afterwards. The sound weapon wasn’t used in combat or tested on people but it is thought that lab animals may have been used. Another acoustic device, which was said to resemble a large cannon, supposedly sent out a sonic boom shock wave with enough force to bring down a large bomber. All of these "wonder weapons" are confirmed fact; if you'd like to chek out various myths (including Nazi UFO Flying Saucer program), then there are plenty of sites to help you along. In our future articles we will touch on fantastic "secret" weapons of the Communist block and, pehaps, some spy technology. 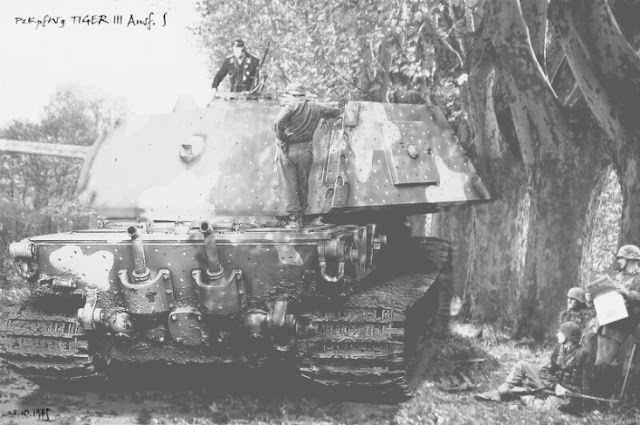 WW2 Nazi Tank Manuals - Unexpectedly Hilarious! A small addition to your information, the "strange prototype" plane with the front and rear propellor is a Dornier Pfeil. 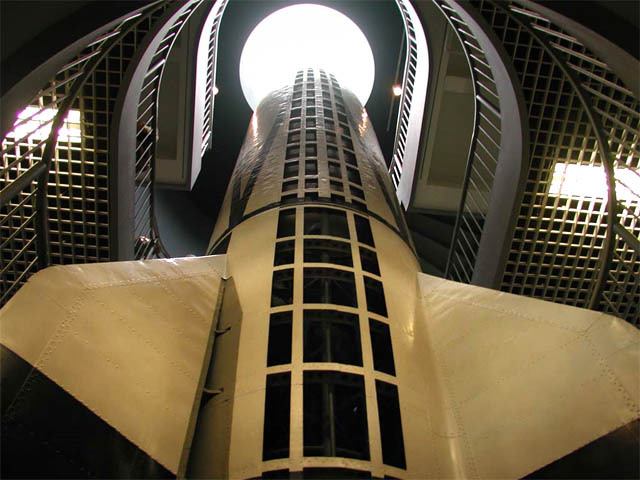 while planned, V-1s were never air-launched from planes. I can't find any info on a USS Essex being destroyed. The aircraft carrier I found on Wikipedia was decomissioned after the war, and used later during the Cuban middle crisis. Nice post! 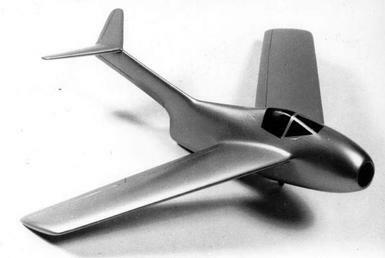 Although one of the shown short-wing planes is a japanese Yokosuka Ōka Modell 11 plane. This kamikaze-plane should have been carried by a bomber to the target. The WunderWaffe 2 looks like a complete crap shoot. 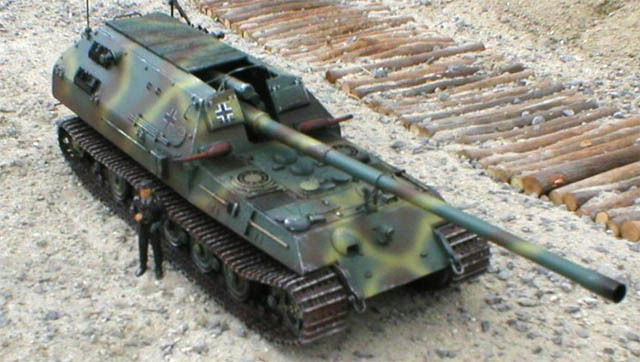 The german word for "curved" means "gebogen" or technicaly more fitting to the curved MP44 "gekrümmter Lauf". The second aircraft in the side comparsion to the V-1 is not a Baka, but a Fieseler Fi103R Reichenberg. 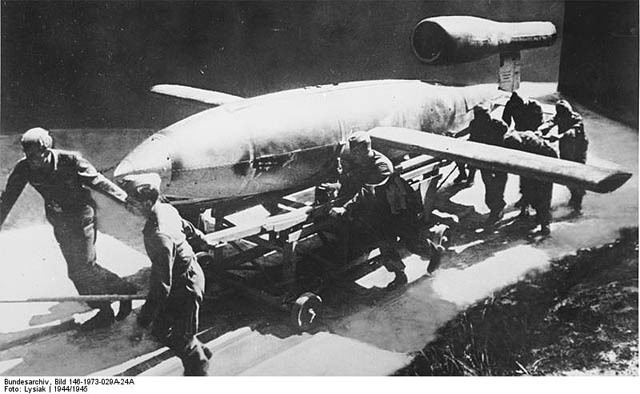 It is a german suicide plane based on the more common Fi103 (V-1), following on reports of sucesses about the japanese kamikazes, but it was used only for training. About 175 Fi103R have been build until the program was cancelled in Fall of 1944. Not only the MiG-15 is based upon the Focke-Wulf Ta183, but also its american counterpart the F-86 Sabre. Because of this similarty pilots of both side during the Korea War had their trouble to identify friend and foe. 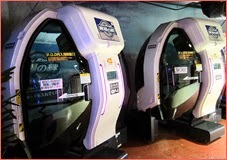 The pictures of the E100 are false. It was never completed. 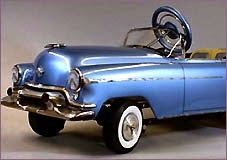 Only one chassis was partially built and it was captured before completion. It was later scraped by the Brits. 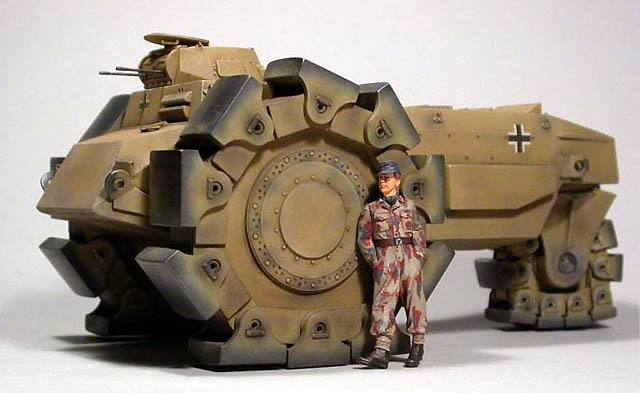 Maus (and especially the larger design study at Krupp) put me in mind of Keith Laumer's Bolos (Gigantic cybernetic... well, tanks, but writ Colossally, Titanically *hyooge*. Intersting article ; you could also have mentioned the (unproperly called) "V3", a very long supergun similar to the one planned by Saddam Hussein during the 90's. Herbicide - I remember reading Bolo stories. Somebody would have to make a movie based on these designs. While the Ar-234 was used as a bomber, it was more often put to use as a reconnaissance aircraft. 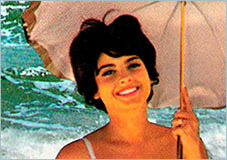 In fact, one of them buzzed some of the Normandy beaches on D-day. It should be said that super-large tanks were a BAD idea. 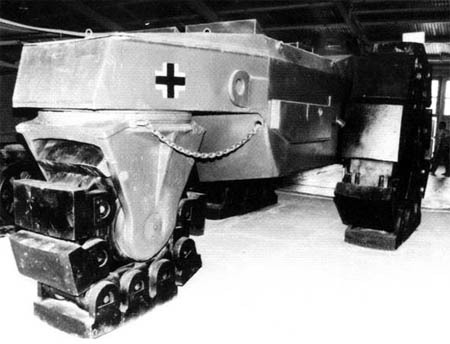 Hitler had been in the trenches in World War I, and he personally demanded that large tanks be designed. He even took personal control, by radio, of the first combat mission of a new-model big tank. The mission was a disaster. Aside from sinking into swamps, not going between obstacles, and the like, they had a more basic disadvantage that they could never be plentiful. 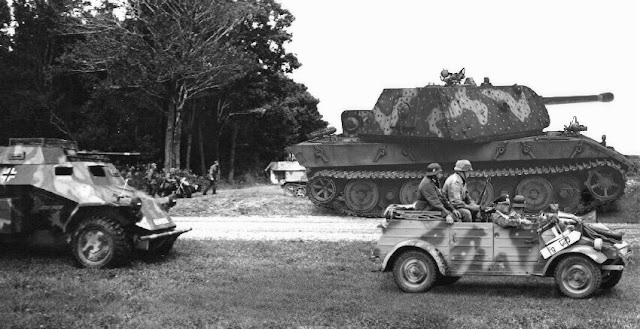 The American light tanks weren't exactly unstoppable, but like the jeep, they were plentiful, and that mattered. Aren't those paintings from My Tank is Fight? 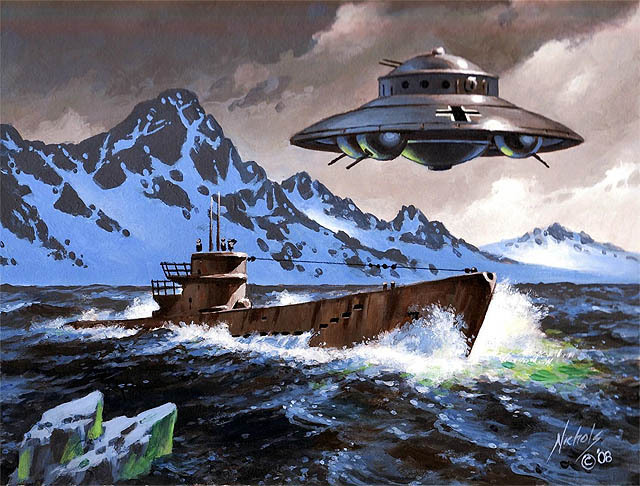 The IR baffles on German submarines were introduced when Allied planes started sinking Nazi boats at night. The Germans had developed IR vision equipment and figured the enemy had done the same and were using it to find the subs. However, the Allies "knew" IR vision equipment was impossible. The actual situation was that the Allies had developed airborne microwave radar, which the Germans "knew" was impossible. So why the fcuk they didn't win the freaking war?!! Looks like the US stole most of their technology to develop what we know as US advanced army. Maybe that's why US goes into war every time, to steal something! The Germans actually relied on a lot of captured Jewish scientists to come up with they're scientific breakthroughs in Aviation and Rockets. I believe the flying wing and swept wing concepts were originally pioneered by them. The Americans took a lot of the captured Jewish & German Scientists/German Weaponry back to the US to further the development as did Russia. 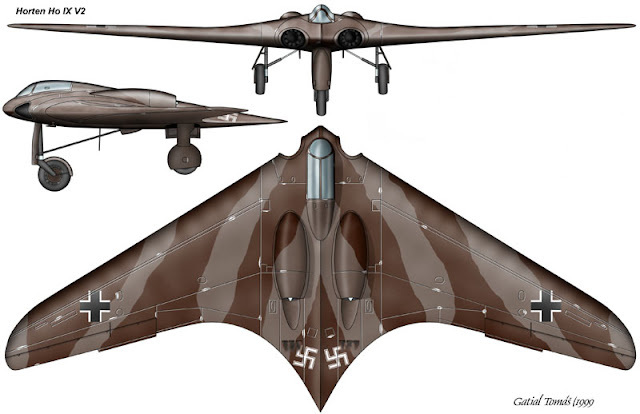 The F-111 and F-14 are two examples of this as are the early Mig's for Russia, the single mid mounted jet engine was also a Messerschmidt concept from memory. Germany in reality lost the war because of Hitler's Ego causing him to make a number of emotional strategic errors, bottom line. I believe Jet fighters were originally held back by German High Ranking officials and quite possibly, Hitler. If these developments had been funding boosted pre-/early WW2...the outcome may have been very, very different and we could all be talking German right now. 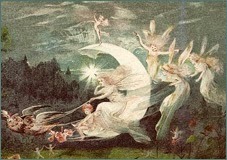 Pretty pictures, yes, but rather gullible writing. The German navigation beacons could certainly be said to be forerunners of GPS... in the same sense that fire can be thought of as the forerunner of lasers. Curved barrels was also designed by Russians for PPSh-41 SMG. 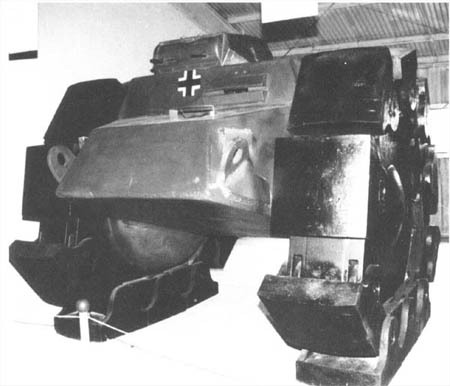 In reality, such barrels were designed to allow shooting not around the corners but rather through the portholes of a tank. 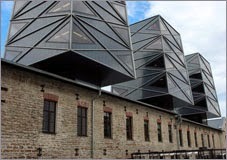 More inmportant is that german designs didn't look gay like the soviet and american rip offs. that's true anonymous, but they had to be further developed. nice item, DRB!!! keep up the good links! beautiful stuff. A shame that more tyranny didn't take place using these weapons. A good number of those weapons had Allied counterparts . . .
You should look up the US "mineproof" vehicles, and some of the specialist vehicles. While the Ar-234 was used as a bomber, it was more often put to use as a reconnaissance aircraft. What about Die Glocke, the German time machine?